the Pomeranian is descended from the larger Spitz type dogs, specifically the German Spitz. It has been determined by the Fédération Cynologique Internationale to be part of the German Spitzbreed, and in many countries, they are known as the Zwergspitz (~Dwarf Spitz). A miniature Pomeranian from 1915. The breed is thought to have acquired its name by association with the area known as Pomeraniawhich is located in northern Poland and Germany along the Baltic Sea. Although not the origin of the breed, this area is credited with the breeding which led to the original Pomeranian type of dog. Proper documentation was lacking until the breed's introduction into the United Kingdom. Two members of the British Royal Family influenced the evolution of the breed. In 1767, Queen Charlotte,Queen-consort of King George III of England, brought two Pomeranians to England. 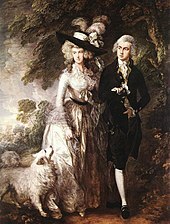 Named Phoebe and Mercury, the dogs were depicted in paintings by Sir Thomas Gainsborough. These paintings depicted a dog larger than the modern breed, reportedly weighing as much as 30–50 lb (14–23 kg), but showing modern traits such as the heavy coat, ears and a tail curled over the back. Queen Victoria, Queen Charlotte's granddaughter, was also an enthusiast and established a large breeding kennel. One of her favoured dogs was a comparatively small red sable Pomeranian which she named "Windor's Marco" and was reported to weigh only 12 lb (5.4 kg). When she first exhibited Marco in 1891, it caused the smaller type Pomeranian to become immediately popular and breeders began selecting only the smaller specimens for breeding. During her lifetime, the size of the Pomeranian breed was reported to have decreased by 50%. Queen Victoria worked to improve and promote the Pomeranian breed by importing smaller Pomeranians of different colors from various European countries to add to her breeding program. Royal owners during this period also included Joséphine de Beauharnais, wife of Napoleon I of France and King George IV of England. The first breed club was set up in England in 1891, and the first breed standard was written shortly afterwards. The first member of the breed was registered in America to the American Kennel Club in 1898, and it was recognised in 1900. Glen Rose Flashaway won the Toy Group at the Westminster Kennel Club Dog Show in 1926, the first Pomeranian to win a group at Westminster. It would take until 1988 for the first Best in Show at Westminster, Great Elms Prince Charming II. The Pomeranian has been among the more popular dog breeds in the United States, featuring consistently in the top 15 of registered AKCdog breeds over the last 10 years. The breed ranked #15 in the 2010 rankings, dropping one spot from the previous year. It is not listed in the top 20 breeds in the UK in either 2007 or 2008. In Australia their popularity has declined since 1986, with a peak of 1128 Pomeranians registered with the Australian National Kennel Council in 1987; only 577 were registered in 2008. However, this is an increase from 2004, when only 491 dogs were registered. It is more popular in American cities in 2008, ranking joint tenth (with American Bulldog) in Detroit and Orlando, ninth in Los Angeles, a joint seventh in Seattle (again, with the American Bulldog), but third in Honolulu, only bested by the Labrador Retriever and the German Shepherd Dog. The Pomeranian (often known as a Pom, or more humorously, Pom Pom) is a breed of dog of the Spitz type, named for the Pomerania region in Central Europe (today part of easternGermany and northern Poland). Classed as a toy dog breed because of its small size, the Pomeranian is descended from the larger Spitz type dogs, specifically the German Spitz. It has been determined by the Fédération Cynologique Internationale to be part of the German Spitzbreed, and in many countries, they are known as the Zwergspitz (~Dwarf Spitz). The breed has been made popular by a number of royal owners since the 17th century. Queen Victoria owned a particularly small Pomeranian and consequently the smaller variety became universally popular. During Queen Victoria's lifetime alone, the size of the breed decreased by 50%. Overall, the Pomeranian is a sturdy, healthy dog. The most common health issue isLuxating patella. Tracheal collapse can also be an issue. More rarely, the breed can suffer from a skin condition colloquially known as "black skin disease", or alopecia ex. This is a genetic disease which causes the dog's skin to turn black and lose all or most of its hair. The breed is currently among the top 15 most popular in the USA, and the current fashion for small dogs has increased their popularity worldwide. 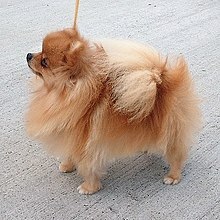 Pomeranians are small dogs weighing 1.9–3.5 kilograms (4.2–7.7 lb) and standing 5.0–11 inches (13–28 cm) high at the withers. They are compact but sturdy dogs with an abundant textured coat with a highly plumed tail set high and flat. The top coat forms a ruff of hair on the neck and back, and they also have a fringe of feathery hair on the hindquarters. The earliest examples of the breed were white or occasionally black, Queen Victoria adopted a small red Pomeranian in 1888, which caused that color to become fashionable by the end of the 19th century. In modern times, the Pomeranian comes in the widest variety of colors of any dog breed, including white, black, brown, red, orange, cream, blue, sable, black and tan, brown and tan, spotted, brindle, plus combinations of those colors. The most common colors are orange, black or cream/white. The merle Pomeranian is a recent color developed by breeders. It is a combination of a solid base color with lighter blue/grey patch which gives a mottled effect. The most common base colors for the effect are red/brown or black, although it can also appear with other colors. Combinations such as brindle merle or liver merle are not accepted in the breed standard. In addition, the eye, nose and paw pad colors are different in merles, changing parts of the eye to blue and the color on the nose and paw pads to become mottled pink and black. The use of toys can be an effective tool in encouraging Poms to spend time alone. Pomeranians are typically a very friendly and lively breed of dog. They love to be around their owners and are known to be protective of them. They bond quickly with their owners, and can suffer from separation anxiety if not trained to spend time alone. Pomeranians are alert and aware of changes in their environment and barking at new stimuli can develop into a habit of barking excessively in any situation. They are somewhat defensive of their territory and will thus bark when they encounter any outside noises. Pomeranians are intelligent dogs, respond well to training, and can be very successful in getting what they want from their owners. The average life of a Pomeranian is 12 to 16 years. A well-bred dog on a good diet with appropriate exercise will have few health problems, and if kept trim and fit a Pomeranian is a sturdy dog. The breed does have similar health issues to many dog breeds, although some issues such as hip dysplasia are uncommon due to the Pomeranian's lightweight build. Some health issues can develop as a result of lack of attention to grooming, and teeth, ear and eye cleaning. With routine care these problems can be avoided. Merle colored dogs may suffer from mild to severe deafness, increased intraocular pressure, ametropia,microphthalmia and colobomas. Merle dogs born from parents who are also both merles may additionally suffer from abnormalities of the skeletal, cardiac and reproductive systems. Luxating patella is another health issue in the Pomeranian breed. It occurs when, through either malformation or trauma, the ridges forming the patellar groove in the knee are not prominent and are too shallow to allow the patella to properly sit securely. This can cause the patella to "luxate" (jump out of the groove) sideways which will cause the leg to lock up with the foot off the ground. Whilst the muscles are contracted the patella cannot return to the correct position. The initial pain is caused by the knee cap sliding across the ridges of the femur. Once out of position, the dog does not feel any pain caused by the slipped disc. Tracheal collapse is caused by a weakening of the tracheal rings in the windpipe. It occurs when the rings that normally hold the shape of the windpipe collapse, closing the airway. The symptoms of a collapse include a honking cough that can sound similar to a goose honk, an intolerance to exercise, fainting spells and a cough that is worsened by hot weather, exercise and excitement. In Pomeranians, a condition often called "black skin disease" occurs which is a combination ofalopecia (hair loss) and hyperpigmentation (a darkening of the skin). Other names for this condition include wooly coat, coat funk, pseudo-Cushing's disease, or severe hair loss syndrome. This condition affects male Pomeranians more than females, and may be inherited. Although most affected dogs show signs following puberty, it can occur at any age. Other conditions can mimic this condition including Cushing's syndrome, hypothyroidism, chronic skin infections, and reproductive hormone disorders.